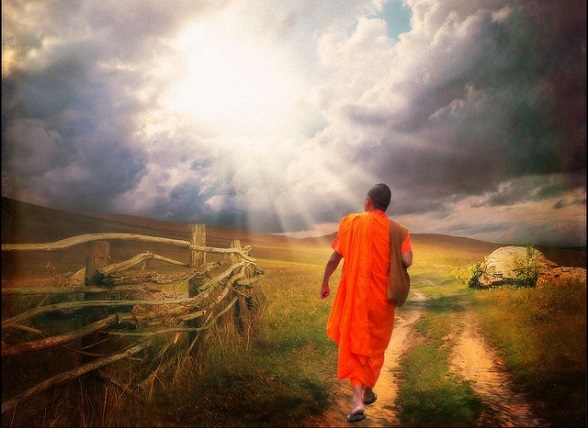 Does philosophical enlightenment make us moral? Does knowing the deepest truth require that we have an ethical character, or does that knowledge foster empathy, compassion, a sense of moral duty? Can a depraved person, instead, perfectly understand the nature of reality? Plato famously maintained that goodness, truth, justice, and beauty are aspects of the same thing so that they go together, but that’s because his worldview was anthropocentric: he projected human ideals onto what he claimed was an eternal, abstract reality underlying the multitude of material “copies” in ever-changing nature. 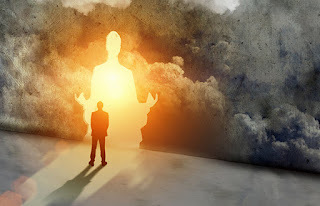 Plato reified human consciousness, arguing, in effect, that because our ideals unify our inner, mental world, these ideals must be central to beings in general. 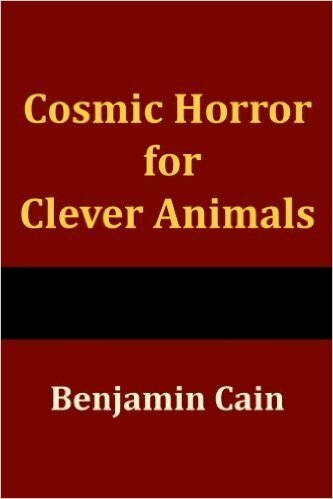 In the West, this was the paradigmatic philosophical rendition of the religious conceit that because we clever creatures presently rule the earth, the universe must be run by comparable divine beings. The human-centered outlook passed for wisdom for many thousands of years, but is no longer respectable in civilized societies. This is why theism or New Thought sentimentality has to be propped up by right-wing bullying or decline in educational standards, or by liberal democratic sanctification of personal liberties in private spaces or politically correct deference to feminine intuitions. Late-modern enlightenment has nothing to do with God, which again raises the Nietzschean question whether we should expect those with the best understanding to be morally superior to the antiphilosophical masses. Indeed, Nietzsche thought that morality itself is the slave’s invention that’s meant to beguile the amoral rulers who are typically too busy and sophisticated to fall for the delusions needed to sustain egalitarianism, justice, or other such feel-good notions. Neither Plato nor Nietzsche was entirely correct about the relation between knowledge and morality, in my view. Enlightenment for us late-modernists is the availability of a form of neutrality that foreshadows what presumably will be the standard outlook of the transhumanists who surpass us. If the apparent dearth of intelligent life elsewhere in the universe doesn’t signify that intelligent species typically destroy themselves, post-humans will have godlike knowledge and power from their technoscientific mastery. To be enlightened now, after science’s undermining of all traditional forms of anthropocentrism, is to understand that the most profound truth is bound to be horrific—not beautiful, just, or good. 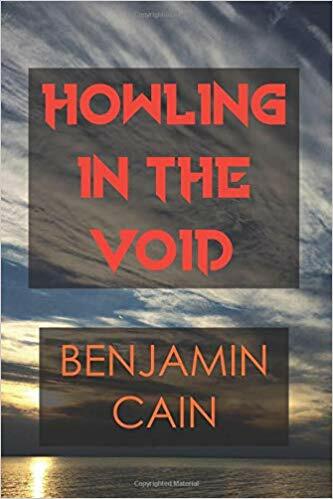 Moreover, those who have more than a mere philosophical hint of this cosmicist sensibility, who will scrutinize the shocking truth as they use technology to control nature at all levels, will of course be corrupted by that power. To put it that way, however, is to presuppose a moral framework, whereas the point now is that morality needn’t be ontologically fundamental. Posthumans will be in touch with ground-level reality; they will be technologically unified with nature, whereas the masses had wished to be one with a divine parent. To be fully awakened is thus to grow past the need for childish defenses or preferences for clichéd fictions, or else it’s to be pushed by capitalistic forces to embrace doom by way of conversion to a posthuman state of apparent amorality. Dateline: MIT—With the election of Donald Trump as president, Republicans have chosen to wear their evil on their sleeves, although the GOP’s social Darwinism, warmongering, and shameless, hypocritical idolatry have been palpable since Ronald Reagan created a bizarre coalition of libertarians and evangelical Christians. 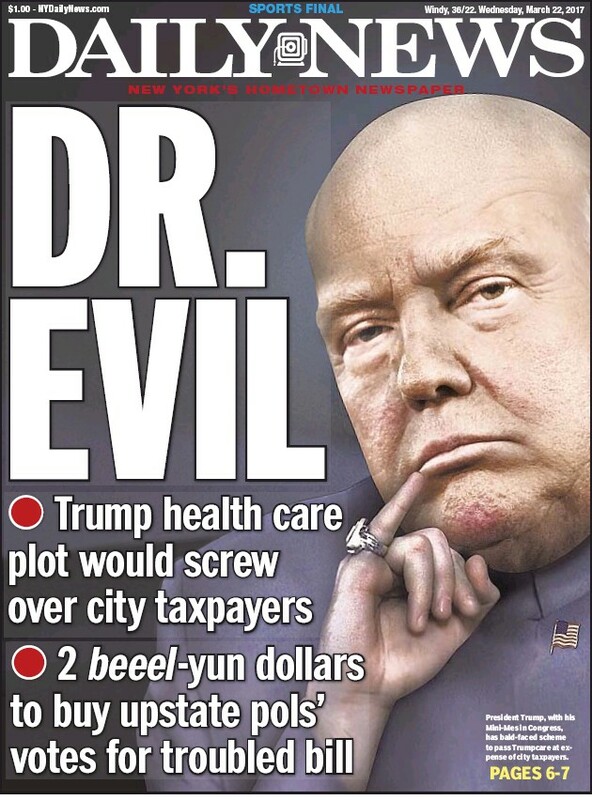 Moreover, Democrats have been unable to dent Mr. Trump’s base of support despite the manifest evil of the entire Republican Party. This widespread sentiment, that the two major political parties in the United States represent a contest between nothing short of evil and cowardice prompted a team of researchers at MIT to investigate the source of the cultural difference. 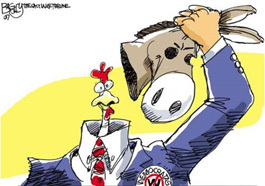 According to Mr. Whatanerd, the team noticed “in less than a second” that Republican politicians are almost all white men while Democrats have a sizeable number of women in their ranks. “It’s not exactly that women are cowards,” Mr. Whatanerd explained. “Women can be plenty courageous if they’re put in a position of having to defend their children, for example. But femininity is bound to be perceived as feeble compared to the vainglory of the psychotic alpha males who have continued to dominate the Republican Party even long after the cultural revolutions of the 1960s. But Kierkegaard found in academic philosophy and especially in Hegelianism an equivalent form of treachery against the human potential. Hegel was arguably the most systematic of early-modern philosophers, meaning not only that he assumed his particular philosophical perspective sufficed to make sense of everything that exists, but that his system was meant to subsume the human individual. Hegel does this by positing a logical process of evolution and self-discovery, culminating in self-consciousness which explicitly is supposed to reconcile all apparent conflicts and contradictions in the progress of its ways of thinking. At one crucial stage in Hegel’s analysis, in his abstract bildungsroman, Phenomenology of Spirit, the individual recognizes that no individual stands alone, that society is a precondition of individuality and so Hegel proceeds from a reflection on how a solipsistic mind attempts to interpret its world, to a consideration of what Hegel called “spirit” (Geist), by which he meant something like culture, the pattern of social conventions that’s due to the mutual recognition between subjects. 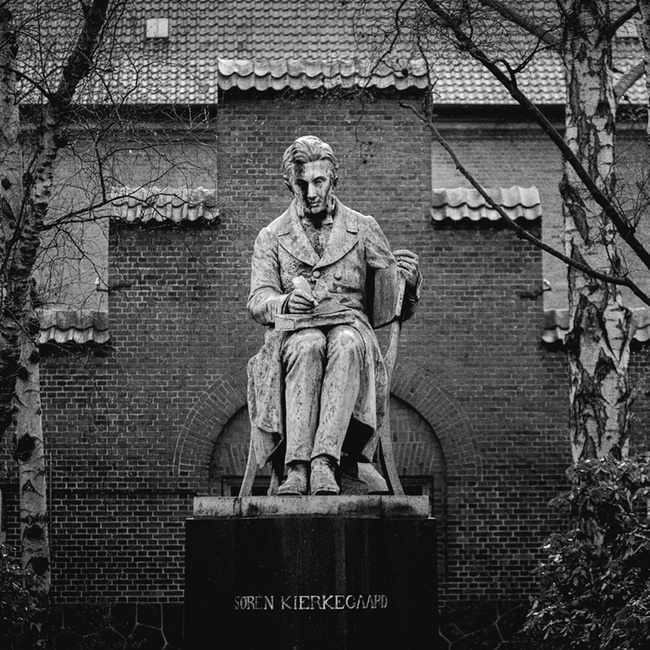 The key point for Kierkegaard is that Hegel posits a progressive, purposive logic or Logos that unfolds from one necessary stage to the next throughout nature and consciousness, the ultimate end being what Hegel called the science of absolute knowing which has been interpreted either as God or as a positivistic, hyper-rational outlook that takes nothing for granted and demands rational justifications for every event, including every judgment. Kierkegaard contends that like conventional Christianity, Hegelian philosophy utterly misses the point—of life and of philosophy. 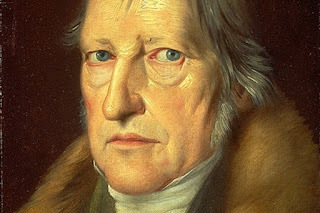 Conventional Christians and academic philosophers like Hegel are after certainty and they present their creeds or their abstract arguments as though they were comprehensive. But Christian dogmas and Hegelian dialectics are at best objectively adequate, meaning only that their concepts might conceivably work as representations of certain phenomena. That’s saying less than you might think, since with enough creativity we’re free to imagine virtually any set of concepts as sufficing to make sense of our experience. Indeed, the plethora of religions and philosophies, models and theories that have been proposed throughout history testify to that freedom. Hegel and the phony Christian insist that there’s progress in that history, that some worldviews are better than others, but if the goal is only objective truth, that progress is illusory on account of its arbitrariness. Pure objective truth would have to do only with a representation’s fitness to its object, regardless of any subjective considerations. According to the correspondence theory of truth, for example, an adequate statement somehow agrees with a state of affairs, by being meaningfully and accurately about the facts that make up that situation. If we ignore all values and purposes, the most that can be said about the objective relationship between sign and its referent is that, all things being equal (that is, in a sterile situation such as an experiment in which someone is asked to identify, say, the images presented in a picture book), the one follows causally from the other. Needless to say, this is a thin notion of truth, especially since in practice we’re free to use symbols creatively in ways that violate that causal relation, as when we think in metaphorical terms or reflect on matters independent of stimuli. Not even the pragmatic point about what symbols accomplish (as opposed to what causes their instantiation) helps much with the notion of objective truth, since we use symbols according to our interests which are subjective. So focusing on alleged objective truth misses the point of living and of philosophizing. Scientific theories, we all believe, are as objectively true as anything can be, but what this really means is that these theories are immensely useful, which returns us to the domain of subjectivity. Beyond the natural meaning of the information contained in symbols and statements, “objective truth” is a bloodless way of talking about the role of knowledge in empowering us to manage our environment. This instrumental context is necessarily subjective, since knowledge is thus used according to a vision of some valued end point. For example, we study natural processes to control them or we apply science to make money in a capitalistic economy, by producing goods that please consumers. Kierkegaard’s point, then, is that Christendom and academic philosophy are empty and worthless if they don’t grapple with the problems of subjectivity. What matters isn’t the alleged fitness of concept and object, since concepts themselves are tools that serve evolutionary functions or other purposes. What’s all-important is the subject’s freedom (her independence from the rest of the world) which traps her in inwardness, in an endless spiral of self-reflections and in a futile search for a foundational purpose. 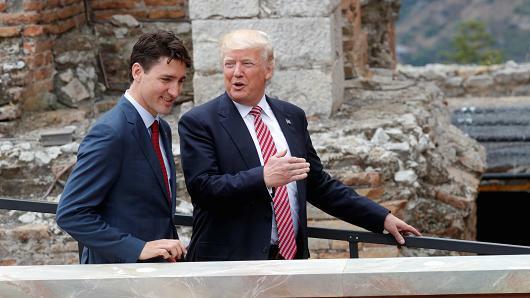 Dateline: CHARLEVOIX, QUEBEC—President Trump’s imposing of tariffs against America’s allies, Canada, Mexico, and the EU, has put these allies in the awkward position of having to remind Mr. Trump that the international system of economic regulations was put in place by America to establish that country as the global hegemon. 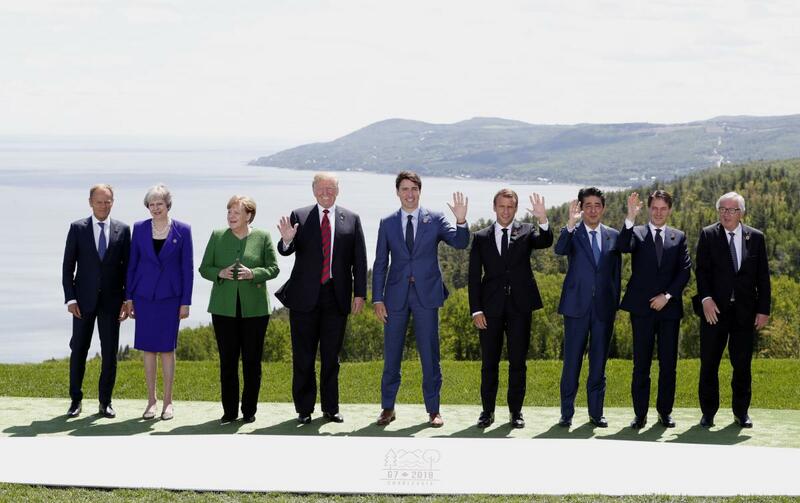 Mr. Trump declared at the 2018 G7 meeting in Quebec that this economic system is unfair because it allows America’s allies to have a trade deficit with the United States, which has sent many American manufacturing jobs overseas. In response, according to aides who witnessed a conversation between some of the G7 leaders, Prime Minister Trudeau, President Macron, and Prime Minister Shinzo Abe explained to Mr. Trump that the US has lost many of these jobs because of the strength of the American dollar, which in turn is due to the fact that the dollar is the global reserve currency. The dollar is used all over the world, which increases that currency’s value, and this makes it more expensive to operate a business in the United States. However, they went on to explain that the global role of the US dollar has been instrumental to US economic imperialism since the creation of the neoliberal world order, the IMF, the WTO, and the World Bank. Since the early 1970s, when President Nixon cancelled the convertibility of US dollars into gold, most oil could be purchased only in American dollars and so other countries have had to trade in dollars to be able to buy oil. “Indeed,” chimed in Mr. Abe, “only those who are individually weak prefer to think of themselves as members of a group so they can feel strong. This is the basis of their slave morality. American economic imperialism is designed to separate the wheat from the chaff, the richest ten percent from everyone else. White identity politics is for losers. The few winners created by this system don’t care about gender, skin colour, or sexual orientation. They care only about money. Mr. Trudeau demonstrated the power of the American dollar by placing an American five dollar bill on top of a Canadian one and chanting the magic words, “USA! USA! USA!” This naturally caused the Canadian bill to disappear. According to the eye witnesses, Mr. Trump only smiled and reminded the other leaders that he already knew all of that. The world leaders proceeded to shake hands and smile creepily for the cameras. Dateline: NYC—A researcher has discovered that American conservative talk radio broadcasts with the same demon-possessed microphones that Hutus to demonize the Tutsis, which drove much of the Rwandan genocide in 1993. The microphones that exacerbate the human weakness for tribalism were created by American-led satanic rituals to further the Allied psychological operations during WWII. After the defeat of the Axis powers, America deployed the microphones against the Soviets in the Voice of America program. In addition, Hollywood infused many of its movie cameras and screens with demonic spirits, extending the tribal propaganda from radio to television and film. In 1993, America offered to sell this technology to the Hutus, but the African ethnic group couldn’t afford the movie equipment and so they opted only for the demon-possessed microphones. 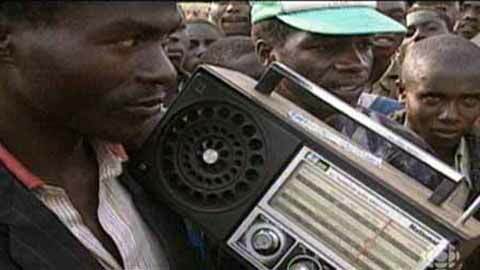 Those microphones allowed them to form Radio Télévision Libre des Mille Collines, which explicitly called on Hutus to kill every Tutsi. In the 1980s, the Cold War radio technology was used inside the US by Evangelical Christians who formed the so-called Moral Majority movement, helping to elect Ronald Reagan by demonizing secular liberals as phony Americans. 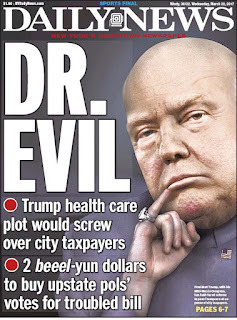 That meme proliferated especially in rural America until Fox News and American conservative talk-radio stations managed so thoroughly to divide Americans that Republicans under President Trump came to hate Democrats more than Russians. According to investigative journalist Marvin Muckraker, who has written a book on the technology of demonization, the intensification of American tribalism under President Obama was only partly racist. This line of argument led Mr. Muckracker to uncover the history of the demon-possessed broadcasting equipment. According to Christian theologian, Willie Charlatan, the demons are invited into the broadcasting device and are then instructed by the propaganda to infest the victim population, which provides the pretext for abusing or even for eliminating the demonized group. 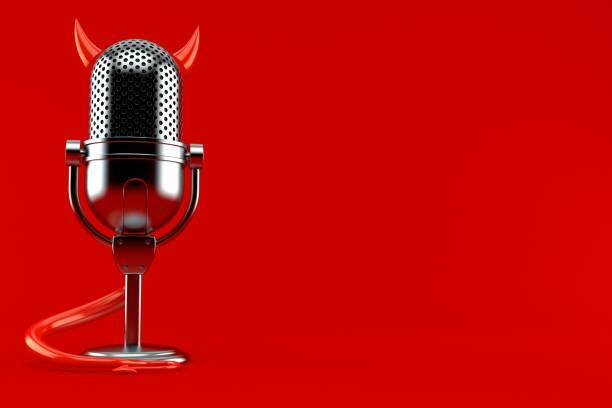 Progressive talk radio struggles in the United States compared to the conservative variety, and industry insiders suspect the chief reason is that progressives lack the demonic microphones.